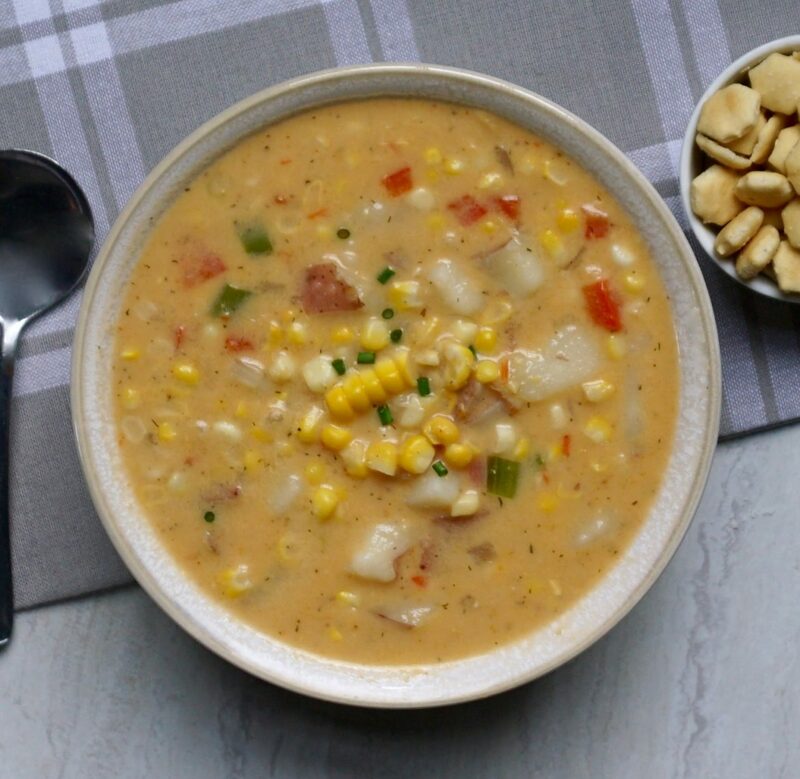 Red Pepper Corn Chowder is a creamy vegetarian soup. Sweet corn is a seasonable vegetable that peaks in August and September in New England. 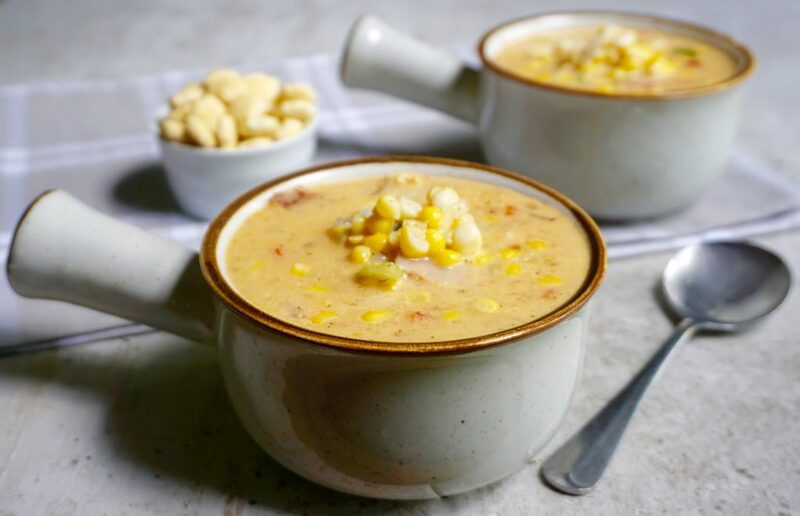 Red Pepper Corn Chowder is one of my favorite ways to use it. 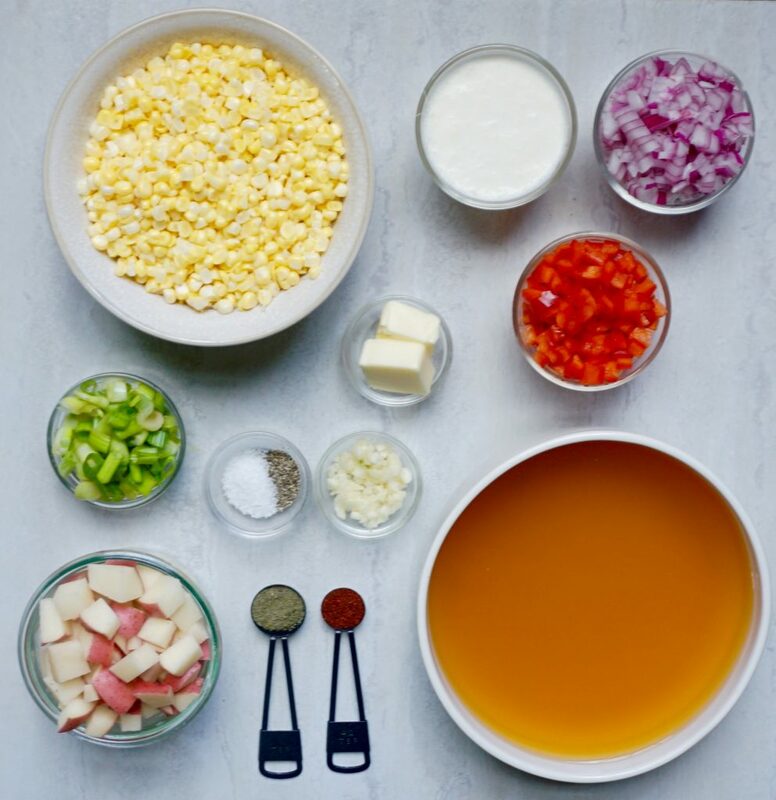 This is a simple vegetarian soup that really highlights the sweet summer corn. 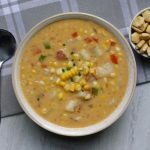 Although I love to make this recipe with fresh corn you can also make it year round using frozen or canned corn. 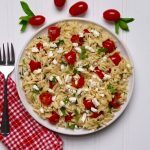 You can also make it now and freeze some for later use. If you do want to freeze it, do not add the cream as it does not freeze well. When it comes time to serve, defrost the chowder, add in the cream, then serve! Melt the butter in a large stockpot. Add the red onion, red pepper and garlic and cook over medium low heat for 3 minutes until they are beginning to soften. Do not let these brown! Add the vegetable stock to the pan along with the potatoes, dill and chili powder. Bring the stock to a boil and then reduce the heat to low and simmer for 20 minutes, until the potatoes are tender. Add the corn and cook for an additional 5 minutes. Remove from the heat. Ladle one half of the soup into a blender or food processor. Puree the soup until it is completely smooth. Pour the pureed soup back into the pot. By doing this, you will be thickening the soup. Stir in the cream and add the scallions. Simmer on low heat for an additional 10 minutes. Make sure that the soup does not boil after you have added the cream. If you want to make a big batch of this and freeze for later, just make sure that you omit the cream before freezing it. Cream will not freeze well. The cream can be added to the chowder when you have defrosted it and are reheating it on your stove. 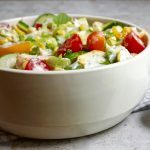 I love a good summer chowder recipe! I made this one and it was amazing. Thanks for sharing.